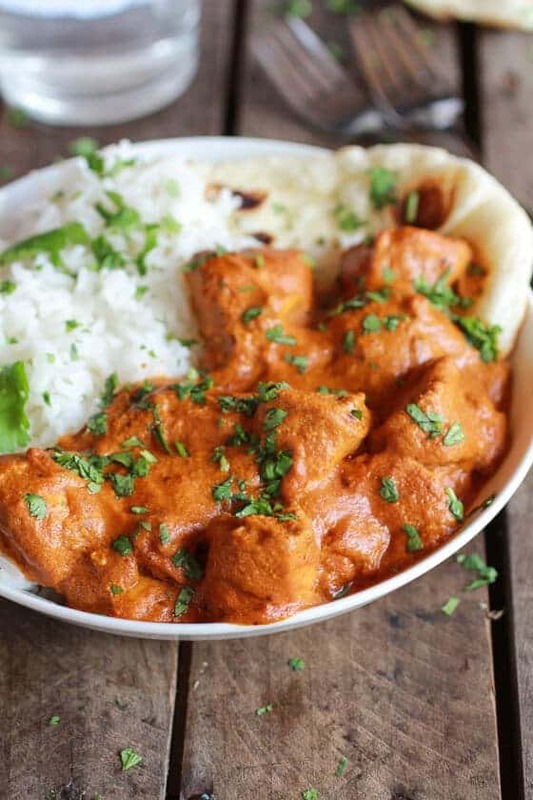 You guys are going to LOVE this Crockpot Butter Chicken! 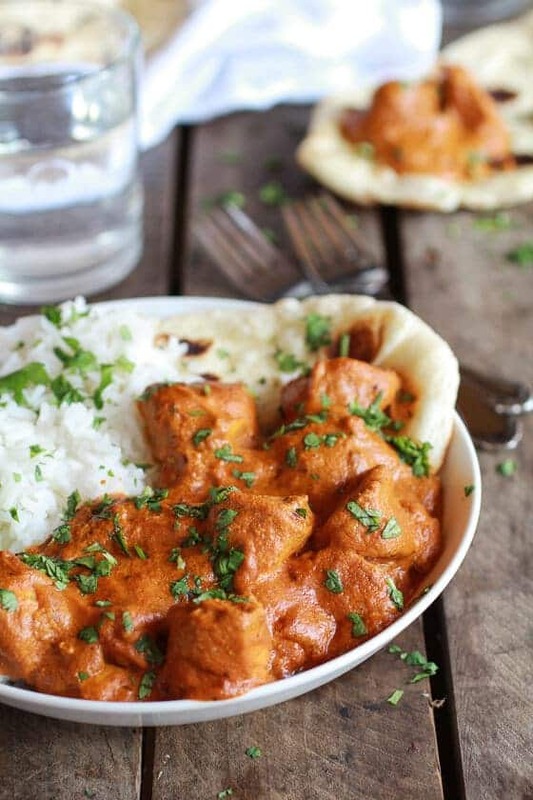 This easy healthier Crockpot Butter Chicken is so delicious! It’s so easy to make, it’s kind of embarrassing. And on top of being easy, it’s also healthier than the traditional Butter Chicken. YES! You see, there was a reason for that Naan yesterday. Butter Chicken and Naan just need each other. Especially when both are homemade and both are incredibly awesome. And oh my gosh… So easy! When I set out to make the Butter Chicken I wanted it to be crazy easy. My cousin Maggie graduated from college with a teaching degree in May, and in August she started teaching full-time. Yeah, only three months later she landed her first teaching job and it’s full-time, with her very own kindergarten classroom! I know, right? The girl is pretty awesome and one of the hardest workers I know. She’s also very busy, but really who the heck isn’t these days? Maggie has been asking for easy crockpot recipes. You know, the ones that you can just throw everything in the bowl, turn it on and go! So I adapted the classic Butter Chicken recipe, made a few changes to make it healthier, threw everything in the crockpot and prayed. Prayed that this (way too easy, most likely would never work) meal actually tasted somewhat edible. Yeah, sometimes I get lucky. I knew three hours in that the recipe was gonna be good. The house smelled amazing. Almost fall like. It was awesome and so cozy. Gotta love cozy comfort food that is not really comfort food. I mean it’s comfort food, just a little lighter. It’s seriously so cozy and perfect for quick weeknight meals. Like I said, just throw it all in and go! I have to say that normally I like browning my meat before I put it in the crockpot, but for this I did not miss it at all. There is so much flavor in the creamy sauce that you don’t need to brown the chicken first. Which is just kind of awesome. I mean who wants to clean another pan? Not me, I’m already up to my eyeballs in dishes. Oh, and seriously, the Naan is a must. In a large glass measuring cup or bowl mix together the coconut milk, greek yogurt and cream. Stir in the tomato paste, garlic, ginger and all the spices. Mix well. Creamy Cashew Indian Butter Paneer…with Fried Paneer! Hey Tieghan! I was wondering if more curry powder could be subbed for the curry paste? What kind of curry paste did you actually use? Thai Kitchen (http://www.thaikitchen.com/products/sauces-and-pastes/red-curry-paste.aspx) makes a great curry paste! I can normally find it at Target for much cheaper than the super market! Thanks Crystal! That is a very helpful link! I need to restock and have not been able to fin it lately. This is perfect! I used Thai kitchens curry paste, but do not sub more curry powder for the paste. If you have to just leave the curry paste out, but try to find it! It adds so much great flavor!! Thank you so much for you kind words. I am so happy to have you as a new follower! So excited to try this!! It’s in the crock pot now. Only thing is I didn’t see this post until after I added xtra curry powder to make up for leaving out the curry paste which I did not have. Is it ruined?! No! I think it will be fine and I hope you love it! Let me know! Hello Tieghan, I cannot find garam masala. Can I replace by tandoori masala? Thank you for the great recipe! I think that would be fine. The flavors may be a little different, but I think still good! Let me know and thank you! My coconut milk cans are 398mL. I am all about this recipe in every way!!! Love slow cooking during the week! Thanks Liz! Slow cooking is always a good thing! First of all – I came upon your website a few days ago and everything looks amazing! I have a question about this recipe – if I don’t have a crockpot, how long do i do it in a regular pot? Hi Udi! Thank you so much for your kind words! I am so happy you are enjoying my site! To make this on the stove, I would brown the chicken first then add the remaining ingredients and simmer about on hour or so until the sauce has thickened and the chicken is cooked through. Or to make this in the oven throw everything in an oven safe dish and cover the dish. Bake at 350 for 1 to 2 hours or until the sauce has thickened and the chicken is cooked through. Hope this helps and I hope you love this! Thanks! Thanks! I’m gonna try it real soon! Made it. A M A Z I N G! Thank you!!! YA!! So happy you love this! Thanks for making it! How do YOU not have a crockpot?? I mean, it is a must for us food crazed people, right? LOL! Thanks Laura and go get yourself a crockpot already! First off the naan looks amazing and so fluffy. 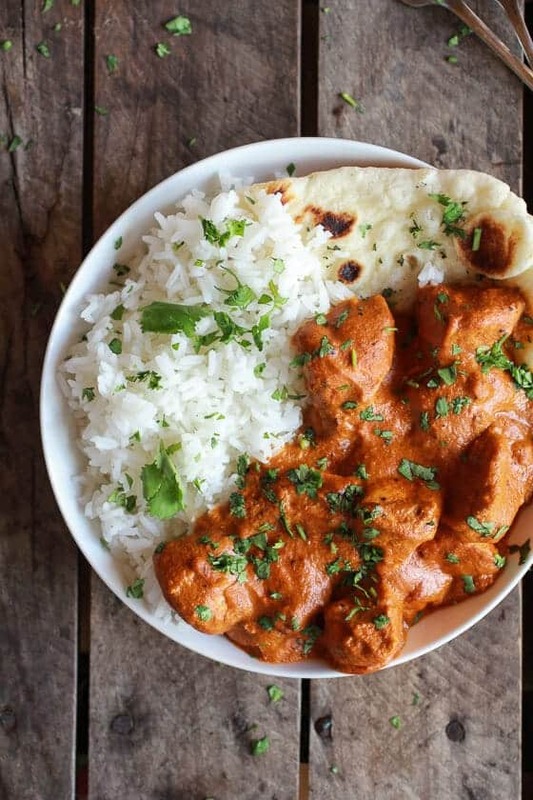 Now this butter chicken looks amazing with the rice. This will be a meal that I will definitely try out. Thanks Meagan! I hope you love this! I like the sound of making butter chicken in the slow cooker! Thanks Kevin! It worked out really well! I should have guessed that after the Naan post, you would give us something delicious to dip it in. I am drooling here at 9:30am. I am definitely making this this week. It is going to be my crockpot week! Woo! I love that you come up with such lovely meals at such a young age. Kudos to you Tieghan! Awe, thank you so much!! I am so happy you are liking me recipes and I hope you love this one!! I want to shovel this in my face! Mmmm! Haha! Thanks Laurie!! It is shovel material for sure! With Ben and I both working and going to school, I hate coming home to slave over a hot stove – I will totally let the crock pot do all the work if I can make THIS!! Open wide and shovel it in!! Yes, I could not agree more!!! It’s a perfect thing. Love the crock pot! Oh I love it when my crockpot does the work for me. Pinned! Woa – I LOVE Indian food – this is such a gorgeous dish! I bet your house smelt wonderful! This sounds wonderful! I need all the crockpot recipes I can get the next few months, keep em’ coming! 😉 Can’t wait to try this one! Thanks Alaina!! I just stared using my crockpot, so I am having fun coming up with recipes! La la la loooooooove curry!!! And you make it in a crock pot, you’re such a darling! Easy, delicious, and healthful meals are where it’s at and you hit a home run with this one. I’m drooling on your naan! Agggh! Happy Monday! Yes! So happy to make you happy! LOL! You are killing me with this and the naan! I want to go home and make this right now. 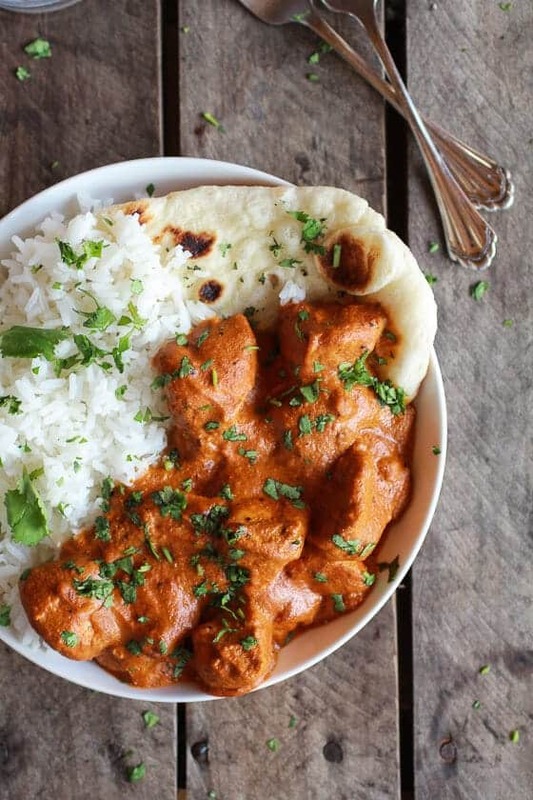 Butter chicken is the best thing ever and with the naan…heaven. Great recipes! Thanks you so very much, Leah! OMG thanks for this recipe!!!!! This sounds soooooo easy and delish I am sooooo making this soon! You mind if I make it on my blog? I will give you full credit for the recipe…. Of course Sophia!! Thanks So much, I hope you love the meal! Just make sure type the recipe in you own words or just link back to my site for the full recipe! Will do! Sooooo excited to try this one!!! Can’t wait! Haha! It’s worth it! Thanks Paula! I am in LOVE with that Burrata crostini! Need it! Can you believe that I’ve never had butter chicken?! This looks so good with your homemade naan! I had never had it before I made it a year ago and now we love it! I just made butter chicken too; after having some a couple of weeks ago at a local Indian restaurant I could not stop thinking about it. I used a recipe from a friend who is from India (you might call it SUPER authentic) but now want to try a crockpot version without frying and hope for a similar result…easy is always my preference. Oh man! An Authentic recipe?? Wow! I wan’t that! I would love to compare the flavors! Naan and butter chicken?! I’ll be right over. I see this being made VERY soon! Once I get my slow cooker back from my home in PA. Question about the tomato paste: how many ounces was the 1 can that you used in the recipe? Hi Sarah! I used a 6 ounce can, sorry about that. I fixed the recipe so the measurement is there! Thanks and I hope you love this! Love how easy this is! Sounds amazing! You are reading my mind, Tieghan! I’ve been thinking to whip up a healthy butter chicken in a crock pot this fall. This looks awesome! The sauce is thick and not watery at all! I recently made crock pot lentils in a similar sauce. Love the combination of tomato paste and coconut milk! Thanks you! It really is a great combo! Yes and YES! Love curry and slow cooker anything is a winner in my book! Thank Lauren!! I love curry too! It is so cozy! I am a sucker for anything covered in curry and served with naan! As a self-pronounced expert on cooking for one, I am finding that crock-pot recipes are some of the best. They make leftovers and are oh, so easy. Thanks for sharing this!! Thanks Chelsea! Crack pot leftovers are always the best! I used a 14 ounce can of coconut milk, but I suggest using the curry paste. It adds great flavor! I have found it at target before, but you can also sub Thai red curry paste if you prefer. With that said I am sure this would still be great without the curry paste. The dish would just be a little less spicy, but still good! This is my crockpot as we speak! Can’t wait to try it! Oh, I hope you LOVE this! Thanks for giving it a try, Kathy! soooo my family had already decided that we just had to have butter chicken this week so we would have an excuse to bake your amazing looking naan bread….and then you made this! so wonderful and easy 🙂 can’t wait to try it out! Oh yay! I hope you guys love both recipes! Thanks Kelsey! What a perfect weeknight meal. As a huge fan of Indian flavors, I am truly excited to try this recipe this week! Oh ya! Thanks so much, Anna! Hope you love this! What a great version of butter chicken! Totally love that you made it in the slow cooker, so smart!! Thanks so much, Gaby! The slow cooker worked awesome! How big of a can of tomato paste? I have seen it in 6oz. cans and 8oz. cans. Also, did YOU use full fat coconut milk or light coconut milk? Looks AMAZING!!! Can’t wait to try! Hi sarah! I fixed the recipe to include the sizes, but I used a 14 ounce can of full-fat coconut milk and a 6 ounce can of tomato paste. Thanks so very much and I hope you love this! Getting my crockpot out right now! This has to happen!! Hehe! Thanks Julie! Hope you do love this one! YES!! So trilled you loved this!! It is a good one! Here you go again; that no attribution business. It’s sad; you seem to have some talent but no one believes you come up with this all by yourself so your lack of graciousness will hurt you in the long run. You seem to have the good fortune Tieghan to live with parents that are supporting you and paying for your ability to grow this blog. That simply does not give you a free pass to do some of the things you do. Which includes the use of booze…underage drinking is underage…your extolling the use of booze when you are not 21 is offensive to those of us with children your age. I am extremely sorry you feel this way, but I can honestly say in no way did I copy this recipe or even ever visit the recipe you linked. May I suggest that if you do not like what you see you simply stop reading? I work really hard on my blog and on developing original recipes. With that said, I realize that there are a million and one recipes for butter chicken out there (and I am sure you could find another 50 that have similar ingredients to mine) and it is very possible that mine may look similar to others. It happens, but that in no way means that I stole recipe. This recipe was developed in my kitchen by trial, error and the ingredients my family likes. In fact I first tried out a tradtitonal butter chicken recipe over a year ago and did not like it. So this year I made adjustments according to my families taste and what I had on hand. That is all and there is nothing wrong with that. I do also realize that I am very fortunate to have such supportive parents that allow me to do what I do, but that does not mean I do not work hard every second of the day. This is my job and yes, I pay my way. I am not your typical 19 year old and I have responsibilities and in no way feel I have “free pass”. As for the alcohol, again I am sorry your feel this way. I only use alcohol in cooking and baking and never to drink, in fact I do not drink at all. Drinking is not something I am interested in, never have been. But again, if you do not like what you see no one is requiring you to read. This is a very good recipe. I am Indian and mom makes the best foods including this dish, however as a working mother and wife I don’t have time to be cooking all day. In case any of you didn’t know, the chicken in butter chicken is actually tandoori chicken which means it was marinated in the yogurt and spice mixture overnight and cooked and then mixed with the cream and the rest of the spices. I actually made this recipe the way it was posted and my family loved it. I’ve made naans at home but this time I used the Pillsbury ones from the Indian store and they are just as good. to the person asking about garnish, Indians use only cilantro for their dishes like the way Italians like their parsley. Thank you so much!! And yup, cilantro all the way!! Wow Virginia, get off your high horse. Here we have a 19 year old that is doing something really productive and is providing a great service to us busy homemakers and you slam her for cooking with alcohol? You seem like the one who needs to do some growing up. You sound very jealous and your post was offensive and petty. Does it make you feel good to belittle a young person who is making positive contributions to society? I have been reading this blog for a few months now and I am very impressed with the amount of work she puts in to provide great recipes. You say she gets a free pass? I am sure she works her booty off to come up with these recipes and maintain this blog. I suggest you QUIT reading her blog if you do not like it and climb back in your prudish cave. Virginia, the recipes are not identical and considering the fact that they’re both recipes for butter chicken, you should expect similar ingredients. Your post is completely unnecessary and, frankly, it’s mean! Even if she were consuming alcohol, she’s 19, not a child. I’m in Canada, where 19 year olds are allowed to drink, so I really don’t see how you can be so offended by someone of her age using alcohol to cook. I just want to say I love this blog and frequently cook recipes from it. I had no idea that a 19-year-old was responsible! 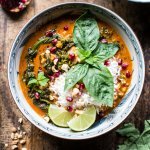 I just want to say how impressed I am to see someone of your age produce such wonderful recipes on such a beautiful blog! It clearly takes a great deal of dedication and you should be proud of what you’ve accomplished. That said, I love, love, love this recipe. I often find butter chicken to be too sweet, especially when it’s sauce from a jar (yuck! I only tried it once, never again! ), and this recipe was perfect for me. I frequently attempt and often fail at Indian cooking, but this is so easy and delicious. Thank you for making an easy recipe for someone who loves to cook, but doesn’t have the time anymore due to a newborn! helped immensely during high school because they didn’t need to experiment. They didn’t cave into peer pressure. Trying this tonight! Perhaps a splash of wine would brighten the flavor? Yes. I think so. And then I will roar with laughter as my children drunkenly crash about the house later. Thank you so much, Kristen!! Your comment made me very happy and I really hoped you loved this meal!! Virginia, your post was so incredibly rude and judgmental! As a mother of 2 daughters myself, I would be appalled if some random stranger called out one of my girls that way. Geez! And for what? Because she developed a recipe that had a FEW similar ingredients to someone else’s?? I, too, can be a recipe detective at times and Tieghan’s recipe is, in no way, a copycat. Not even close. Tieghan, I’m sure your parents are very proud of you for creating such a great cooking blog – not an easy task in a very competitive market. I’m trying the recipe tonight and will come back to review it some time soon. I love easy crockpot dinners! Hi, I was wondering what type of Curry Powder you use? Isn’t there a few types like red or yellow? Thanks for your blog. Don’t let what others say deter you. Anyone who leaves comments like that is simply jealous. You do an amazing job with your recipes and blog and I am really impressed! I use this curry powder, it is yellow in color. Thank you so much for your kind words. You have no idea how much they mean to me and how much I appreciate your support and you reading along everyday! Your comment made my day today! Thank you! Made this for dinner last night and it was a big hit. Needs a little something sweet so next time I will add a little cinnamon or some golden raisins or maybe some mango chutney but other than that it was good. Served it with jasmin rice, green peas and naan. Can not wait for the leftovers. Oh yah!! So happy you loved this! Thanks for making it, Laura and let me know how the cinnamon goes! Sounds good! We had the leftovers last night for dinner and added some Mango Chutney. This hit the spot…it added just the right amount of sweetness. Plus after the curry sat in the refrigerator the flavors got even better. Such a nice dish! Oh yum! Sounds awesome!! Thanks so much, Laura! Thanks for this recipe! Mine is cooking right now and it smells and looks great. I am using chicken thighs because I had some in the fridge. I am thinking that next time I should add more meat or some peppers or other vegetables to it, or reduce the amount of sauce. There is a huge amount of sauce compared to the meat. Thanks for the great and easy idea! I’m sorry to see the negative comment and useless mean words. I can’t wait to try some of your other recipes! Thank you so much, Kelsey! Yeah, there is a lot of sauce (we love a lot of sauce) and I should have mention that I did add broccoli to mine after cooking to add a little green to the mix! I really hope you love this and thank you so much for your kind words!! Hope you love the other recipes you try as well! Hi, this looks delicious! I was wondering… do you think this recipe would be okay to be doubled? I have more chicken that is called for and wouldn’t mind the leftovers, but I’m not super familiar with crockpot cooking, so I don’t know if doubling everything would just make it very saucy or take much longer to cook? What do you think about making a larger batch? HI Becca! I think doubling this would work fine, but I would cook the dish on the longer side to make sure the chicken is fully cooked. Hope it works great and I hope you love the dish! Hi! I found your recipe via pinterest and it’s in the crockpot now. I tasted it and it’s delicious – though I’m glad I trusted myself and reduced the spice. I left out the thai curry paste and reduced the cayenne to 1/4 t. It still has a little kick, but my kids will still eat it. I’m sure if I had left in the amount of spices they would not have eaten more than one bite. So happy you loved this and am glad you fixed the spices to your liking!! Thanks Katie! I am not a fan of Garam Masala…I see there are 2 Tbsp in the dish….would it break the dish if I didn’t add it? Would it lose all the flavor? I love curry…just wondering if that would be enough? Hi Sharon, I do think you can leave the Garam Masala out. I think the dish will just taste more like a delicious creamy curry! Hope it works out and I hope you love this! HI there! Great recipe btw! I just wanted to ask what sort of rice you used with that dish? Jasmine rice or basmati rice? Thanks and keep up your wonderful food blog! I really love both, but for this I used Jasmine rice..
You are rockin’ the crockpot with this one! Thanks for linking up with What’s Cookin’ Wednesday!! As someone who is very sensitive to hot things. I mean sometimes even the mild in someplaces are too hot for me. Is this dish spicey? Hi Josh, this dish does have just a little kick, but you can skipping the cayenne and reducing the curry paste to 1 teaspoon. That should make it pretty mild. Hope you love this! Since the first time I commented on this post and asked about using the stove instead of a crockpot, I made it 4 times. This is by far the best dish I made and everyone loves it (and demands I make it again). I was wondering, though – is there any way to make this dish with less calories and fat? I’m not that experienced in the kitchen so don’t know how to experiment 🙂 Is there a way to replace the butter/cream/coconut milk with anything else? I am so happy yo guys love this! To lighten the fat content in this dish I would use lite coconut milk or you can try 2% milk, but you will miss some of the flavor and creaminess of the dish. Also bump up the greek yogurt to 3/4 cup and leave out the cream, that is what I would try. Hope this help and again, thank you so much!! SO happy you guys love this! Hey Tieghan, what if we used coconut butter instead of the butter and then used milk and greek yogourt in place of coconut milk and cream. Do you think that would work? Also girlfriend you blow my mind with your recipes. When I first started following you I thought you were a much older chef who ran a professional kitchen. My dear, your recipes are truly amazing and original. Keep them coming please. Hey Dale! I think that should be fine! And thank you SO much!! I will do my best to keep em coming! Wow! This was really good. I didn’t alter anything from the original recipe and thought it was great. I wish i”d had some mango chutney in my fridge…that would have gone great with this. Thank you! I loved it. So thrilled you love this! Thanks so much, Karen! hi i love your recipes!! was wondering.. is there something else that you can replace the coconut milk with ? Thank you so much!! You can swap the coconut milk with cream or greek yogurt. Both work great! Hi, thanks for posting this recipe. I really like trying new cuisines from around the world, and I am so excited to make Indian food this weekend! I am not well-versed in Indian spices…but from what I understand, curry powder and garam masala are both blends of different spices. Is this the reason you didn’t list cumin as an ingredient? If I also add 1 tsp of cumin, do you think it will overpower the dish? Hey Christina! You can totally added 1 teaspoon of cumin, I do not think it will overpower the dish. Especially if you like the cumin flavor! Hope you love this and thanks for making it! Hi! I’m so excited to try this! It looks so beautiful and delicious and I’m so impressed that you are only 19! You should be so proud :)! I have one question… I’ve always heard that you’re not really supposed to put milk products in the crock pot for longer than an hour or so because they are capable of curdling… Have you ever had this problem? Thanks in advance! Oh no!! To thicken it up real quick add a 1 tablespoon of cornstarch to 1 tablespoon of water and then add that to the crockpot and place the top back on for 30 minutes. That should do it. I wander why yours was runny. Did you add any extra liquids? I made this tonight as my first ever slow cooker recipe and it was easy and delicious! I only wish I’d read all the comments or realized how spicy the cayenne pepper would make it. Sadly it’s too hot for me but still so yummy 🙂 I will make if again for sure but reduce the pepper to 1/4 tsp and I’d also add some more chicken. Do you think I’d need to coin it longer if I added 50% more chicken breast? Thanks for the great recipe and I’m going to check out your others…the quinoa bake in another comment caught my eye! So happy you loved this, Daisy! Sorry about the spice though!! I do think you should probably add at least on hour or so onto the cooking time. Adding more chicken will slow the cooking down a bit. Hope you love the quinoa bake! Hi Tieghan! I just made this and am loving it! I’m just thinking mine is missing a slightly sweet taste. Do you have any recommendations for me? Hey Amber! So happy you loved this! If you want to add a little sweetness, I would add a 1 tablespoon of brown sugar or honey. Hopefully that should be just the right amount of sweetness for you! I just made this, though I added in some extra firm tofu(Soy Boy’s Tofu Lin), and its fabulous. I marinated the tofu in yogurt with some curry powder and garam masala for an hour and then pan friend it before adding it to the crock pot. The spice on this dish is great and it actually relieved my stuffy nose! That tofu sounds awesome!! SO happy you loved this!! Hey Gemi! You can swap the coconut milk with milk and you can normally find curry paste in the ethic food isle in most grocery stores, but if not you can buy it here on Amazon. Hope that helps and me know if you have any more questions! 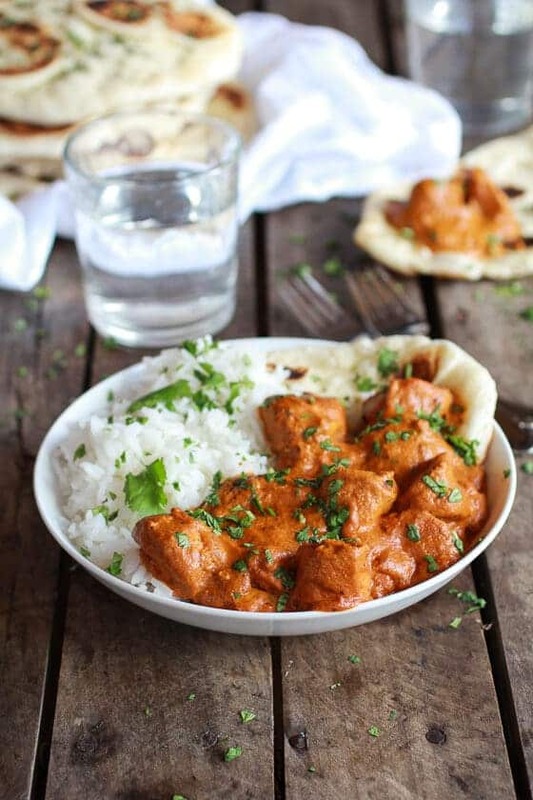 This is my “go-to” recipe for butter chicken! Thank you so much for it, it is absolutely perfect!! YAY!! Hope you loved it!! I made this last night and just wanted to weigh in for people who might be making this for little ones/ toddlers in their family. My 18 month old loves all kinds of spices and ethnic flavours (Moroccan and Thai being her favourite!) But I found this to be MUCH too spicy for her, and she can handle spice. – significantly reduce the amount of cayenne pepper – 1/4 or even 1/8 of a tsp. should do it. – I would add red or yellow curry paste next time instead of the green that I had on hand. I should have known using the green paste (the hottest of the thai curry colours!) plus the cayenne would be too much. -bump up the amount of greek yoghurt a little bit. I also added chopped carrot at the beginning with the sauce and chicken to cook. Then added frozen peas about 30 min. before it was done. Would have been a great “complete” meal had it not been so spicy! Thank you so much! I cannot believe you got your 18 month old to eat this. Amazing! I have made this twice & it’s great. I used 1/4 tsp of cayenne and it was still pretty spicy, and lite coconut milk. Served it with basmati rice & garlic naan. Thanks for a great recipe! YAY!! This makes me so happy! Thanks Jody! Basmati + Naan are a must for this meal! This sounds awesome! I would love to try but my husband is allergic to coconut. Any ideas on what I could substitute? Use can use almond, whole milk or heavy cream. No big deal at all. Hope you love this meal! This looks delicious! I’m going to try it this week! Do you think you could chop up a potato and add it to the crock pot with the chicken? And maybe some frozen peas at the end? Just wondering if you think it would still turn out as tasty! Thanks for Sharing! I think it would still be great!! Hope you love this, Cassie! Hi, can this recipe be made without the dairy? Can I substitute more coconut milk for the heavy cream? Hey Rachel, that should work fine. Hope you love this! Hi Tieghan, I made this last night and I am now addicted to it. Amazingly good and as you say sooo easy. Great website too. I stumbled across this recipe on pinterest and thought I’d give it a go…… OMG so glad I did! It was delicious, even my 5 year old loved it! It will become a staple in our menu for sure. Thanks for sharing! Oh yeah!! Thanks Kirsty! This makes me so happy! 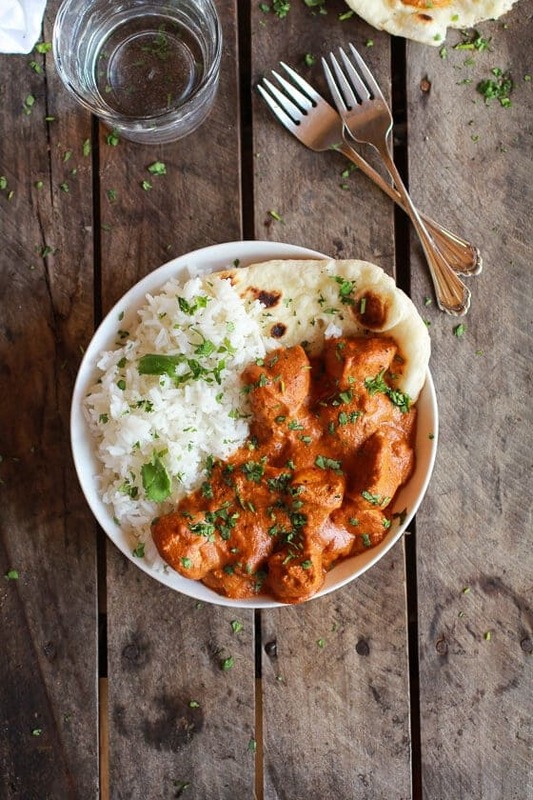 I love butter chicken, love the idea of doing it in the crockpot. My husband just asked me to make butter chicken for dinner next week, and the one I have done is a lot more work. Quick question on the curry powder, is it the brown or yellow you use? I like to use yellow curry powder. Thanks so much and and hope you guys both love this! I am not the biggest fan of coconut flavor. Does the coconut milk leave a strong coconut flavor? Could I increase one of the other items in place of it? They coconut milk really adds not flavor at all, but if you wish you could swap in whole milk or more heavy cream. Hope that helps and I hope you love this dish! Best Butter Chicken recipe… PERIOD! And how much easier can it get than in a crock pot. Even if you don’t have one it is worth making on the stove or oven! It is that good. The right amount of spices and flavor are exceptional! This looks beautifully delicious. Any recipes for basmati rice with cumin? Now rice recipes with cumin. SO sorry! This is in the crock pot right now, and the house smells amazing. Can’t wait to eat! YAY!! Hope you loved it! 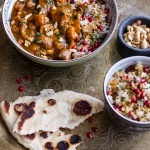 I would like to make this next weekend but for 10 hungry ladies after a day of cross-country skiing served with rice and naan should I double it or triple it? Hey Chris, I would probably triple it just to be safe. Make sure your crockpot can hold that much food. Also, there may bee too much extra sauce. You may need to thicken the sauce a bit on the stove to reduce the extra liquid. Let me know if you have any questions and I hope you all love this!! So pumped, this is in my crock pot right now! I tried the naan a few weeks ago and me and my husband both LOVED it! 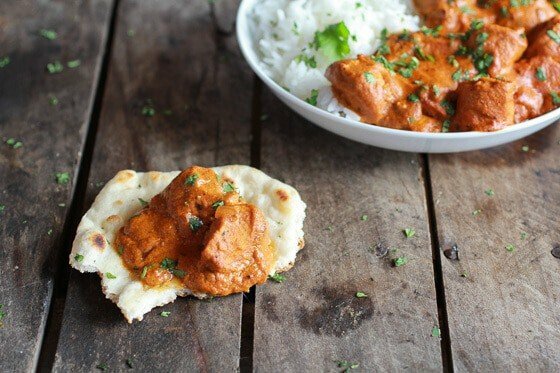 I’m making the butter chicken tonight and I’m so excited! 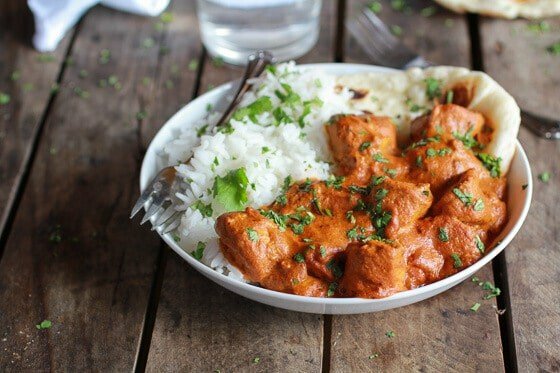 I’ve had butter chicken at an Indian restaurant before and it is one of my favorite meals but have always been to intimidated to make it until I saw your recipe! Thank you so much for the simple recipe!! I can’t wait to taste it!! Was just wondering if it is spicy, sweet, or a mixture of both? 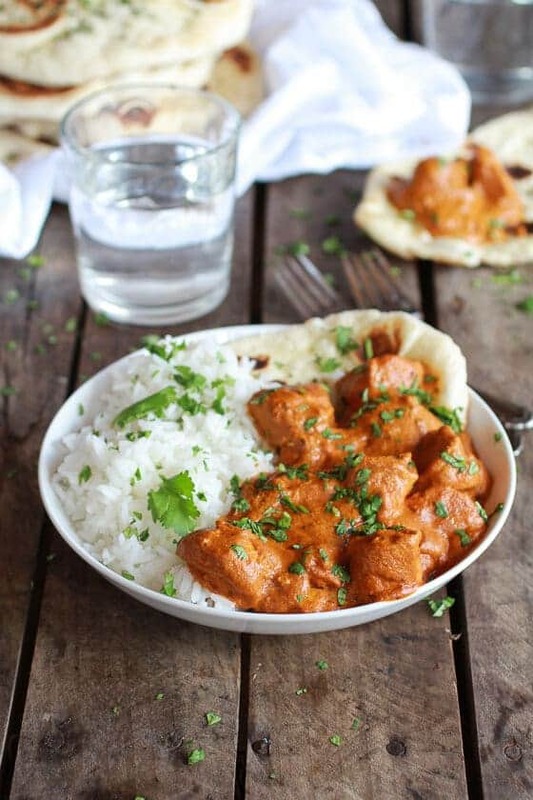 I have had butter chicken numerous times, but have never attempted to make it from scratch! This looks scrumptious and I cannot wait to try it out! It is not very spicy, but does have a little kick with a hint of sweetness. Hope you love this! Hi Tieghan – I plan to make this amazing sounding dish today but wonder if I can sub the cream with more Greek Yogurt? I don’t do cream at all. How about almond milk – I have both these items in stock. Thanks! Hey Jane, I think either one would be fine, but the dis may not be as creamy. Hope you love this and let me know if you have any more questions! Made this last night – been looking for interesting chicken recipes for the crock pot and we love Indian food so thought I’d give it a go. I’m in the UK so was able to get pretty much everything from my supermarket (the only substitution I made was the tomato paste which we don’t really have in cans here – I subbed for a combination of tomato passata and tomato puree and I subbed cayenne pepper for 1 tsp chilli flakes because that’s what I had in the house!). It was FABULOUS. Really loved it and will definitely make it again and my other half loved it as well. It’s creamy and gorgeous and we served it with Basmati and Garlic Naan. For people asking if they can sub out the coconut milk, I’d say it’s worth it for the creaminess and the taste it gives. You just can’t get that authentic taste from anything else! 1) Even if I follow ingredients EXACTLY, my crockpot tends to retain a lot of more liquid than the author of the recipe. This happens for pretty much every crockpot recipe I’ve ever tried. It seems to be very efficient at keeping in moisture. Using some cornstarch helps a bit…but not perfectly. 2) I used tomato sauce since I didn’t have tomato paste, and I used 1% milk instead of the heavy cream. This obviously adds additional moisture. 3) I have a 6 qt crockpot, and this was done in less than 6 hours on low heat (maybe 4?). I suppose I could have left it in longer to concentrate the sauce, but I was afraid of the chicken drying out. Maybe it would have been fine. I’m not sure what size crockpot you used. A smaller one would take more time since not as much of the food is near the heated parts of the pot. Brands/models can differ a lot too. So…the first day it was good, but wasn’t as red/concentrated as yours and the sauce was a bit too watery. But, today, I just ate some for lunch and now that it has sat in the fridge for awhile, it was really good and I’m craving seconds! So, if anyone has a crockpot like mine, or you sub in more watery ingredients and don’t follow the recipe exactly, try a little cornstarch slurry first…but it will probably taste much better the next day after all the flavors concentrate :-). I find this to be true with most slow-cooked meals. Nice recipe Tieghan! I have yet to find a recipe I haven’t enjoyed on your site. Also, the plans for your new barn house look awesome! I’m so jealous…hubby and I are still renting an apartment, which is nice, but we can’t do anything cool to it. in your photos there is a torn green herb sprinkled on top…is that cilantro?? i don’t see anything in the recipe to match. thanks! Yup! Sorry, I forget to mention it. I will add it in. Hope you loved this. Thanks! Can i make this in the oven and double the recipe? Yes, you can. Just be sure to adjust the cooking time. I would cook it at 350 for at least 2-3 hours, but I am not sure. Just make sure the chicken is cooked through and the sauce has thickened slightly. Hope you love this! 1. It did take about 45 min for me to prep everything (chopping/cutting/pressing the onion, garlic, chicken, ginger, etc) and measuring out all the spices, plus I have a manual can opener, haha. 2. Note to those teachers out there: this recipe will not survive 11 hours on low. haha. I put it in at 7 when I left for work and I came home at 6 and it was BURNT all around the edges and had a crust on top. I don’t believe my crockpot seals moisture well, but either way, I had hoped it would survive, I was wrong. Do you know if the “warm” setting on the crockpot is lower? I have “Low -> Hot -> Warm” as my options. 3. I was able to salvage enough to eat with one serving for leftovers and HOLY spicy monkey this was spicy, and I only put in 1/2 a tsp. I am a bit of a spice wimp, but this burnt my throat, I had to add a bunch of shredded cheese (I would’ve used sourcream if I had any) to cut the spice so I could eat it. I know, for myself, I probably should stick to 1/8 of a tsp next time. 4. There is something about it that is different than the restaurant style and I’m trying to figure out which spice it is so I can adjust it. It had a sweet flavor, not overpowering, but noticible (a sweet like cinnamon, sweet, not sugary) and all the butter chicken I’ve had has had a more savory flavor. I know I want to add more Garlic, and less cayenne, but I’m wondering if it is the garam marsala that adds the sweetness? should I cut this? What could I add to make it more savory? ( I know it is hard to describe flavor profiles through text, heh) I like the tumeric at the level it is at, and the curry powder, but I’m just not sure what to do next time. Thanks so much for the notes! Sorry for the trouble you had, but I would not take out the garam marsala. Honestly, I do not know what to tell you to do, maybe decrease the amount of tomato paste because that is the only sweetness in the recipe. I will also edit the recipe to say to use less cayenne if needed. Thanks again and I hope the second time goes better for you! I just wanted to thank you for an amazing recipe. It is the best crock pot recipe I have ever cooked and I have cooked many! My family loves Indian food and the Naan recipe was brilliant also. I doubled the recipe and added a cup of lentils and one peeled, cubed sweet potato with about 1 hour and half cooking time left. It got rave reviews from my family and I will certainly be making it again and can’t wait to try some more of the recipes on your blog. Thanks again. Another fantastic recipe. I made it on Saturday and it was perfect! Thank you Tieghan for this recipe. I followed it exactly, save for using boneless skinless chicken thighs instead of breasts (next time I will use breasts). The flavour was spot on. Cooking everything on low for 8 hours rendered the extra fat of the thighs and I was presented with a bright red thin layer of oil on top of the slow cooker. It was easily removed though. Paired with basmati rice and nothing other to say than OMG. I forgot to add the salt, but next time…. So happy you love this!! THANK YOU! Fantastic recipe! I have made this several times, and thoroughly enjoy it every time! My teenagers love it, too, and my youngest is pretty darn picky! I also enjoy that this is a bit lower in fat that you’d expect, but tastes just as good. I’m following Weight Watchers and I can eat this with a small piece of Naan and some rice without blowing my daily points! 🙂 In fact, I can even use some of my weekly points for a fabulous glass of wine to enjoy with this delicious meal! Thanks! Haha! Ya! So happy everyone loves this. Thanks! Hi, I made this dish and it IS delicious. Very, very tasty. I don’t cook, so this was nothing short of a miracle. Haha! There is no nutritional value listed for the recipe, so I was wondering if you could list that. I’m just curious about it–calories, fat, carbs., protein, etc… Thanks! OMG!!! I’m making this now and it smells amazing! YES! Hope you loved it! Thanks! We tried to like it but guess we aren’t big on curry and I cut that way down. Thank you so much for this recipe!!! I am an Indian and was trying to find an easy way to make this for all my friends. And thanks to you, now I can. The taste of this chicken is right on the mark!! I will not be ordering butter chicken from my favorite Indian restaurant EVER again. This is amazing. The flavors were excellent and both my husband and I agreed that I need to make this at least once a month. Just a couple notes – I forgot to buy curry paste so just upped the spices and it turned out great. I also doubled the entire recipe but should have tripled the chicken for the amount of sauce that it made. YAEH!! This make me so happy. I am thrilled you two loved this! THANK YOU! Wow, maybe just ONE MORE picture of that bowl would add the finishing touch. I wanted to like this, but it was definitely missing something that I can’t put my finger on. Hey Nickie, sorry this was not for you. Maybe it was not spicy enough? looks yummy! what would you substitute for a diary free recipe? I would use canned coconut milk for all the dairy and then coconut yogurt in place of the greek yogurt. Hope you love this! I’ve made this before and it turned out so good! How long should I cook in the crockpot if I double or triple the recipe for a potluck? Hey Stephanie! So happy you love this recipe. I would cook it probably 8-10 hours. Hi there, I am excited to try this. Where can I buy garam masla? Thank you! You can buy it at most grocery stores or online. Here is a link. Made this last night for dinner, it was delicious & so, so easy. My husband came home after it had been cooking awhile & exclaimed “It smells incredible in here!” My only issue was that the sauce was very thin, & did not coat the chicken like in the photos. I did have to use a mixture of half & half & almond milk, because I didn’t have enough half & half, but I don’t think that could caused it to be as thin as it was. Maybe next time I’ll omit the half & half & just use extra yogurt, or just use the coconut cream, not the watery stuff at the bottom of the can? Anyway, again, it was very tasty & I prepared it in no time, will def make again. SO happy you all loved this, thanks!! I would just try leaving the top of the crockpot for 30 minutes prior to eating, that should thicken it up and also, not using the watery stuff will help too. SO excited you love this recipe, Johanna!! I would prefer if you could just link to my site for the recipe instead of reposting the recipe on yours. So happy you loved it! Thanks Marissa! I’m in good company loving this recipe, I see (with good reason). I’ve spent A LOT of energy making butter chicken in a skillet and I got some inconsistent results…..so THIS method and THIS deliciousness was very welcome. Loved by everyone in the family, and served with a sigh of relief from me that it didn’t take hours of intricate steps to create. Can’t keep from mentioning the perfection of Naan to scoop and dip this with. SO very excited this recipe is a favorite of your, THANK YOU! If I want to make this recipe for about 8 people, would I just double every ingredient in this recipe? I figured most things would just be doubled, however, I wasn’t sure about the tomato paste and coconut milk if doubling would be too much? The coconut milk might be a bit much. i would start with the original amount and then add more as needed. Thanks so much for developing this recipe! It is in the Crockpot right now and my mouth is watering just thinking about it. I meant to ask…what do you garnish the dish with? Cilantro? Yup, cilantro! Hope you love this! The comments about alcohol did give me a chuckle. Americans need to look outside this country, we took a family trip to Europe last summer and visited 5 wonderful countries known for food and in Italy and France they asked if our 13 and 15 year old kids wanted wine. We have a 19-year-old and we let him have some because 19 is legal in Canada where we’re from. I didn’t know the blog owner is a teen!! Good for you! So proud of you that your parents raised this amazing person who has a passion for food! I made this last night during a snowstorm and it was perfect, my roommates love it too! I used 1.5lbs of chicken breast but kept all other ingredient amounts the same and I think it was the perfect amount of sauce. I also used plain white rice since that was all I had on hand. Definitely going to make this again, next time with naan. Thank you! I’ve made this and your crockpot ramen twice each now, and they are both so good. Thank you so much for these recipes! I’ve only had butter chicken from one place and it knocked my socks off (unfortunately it’s in Okinawa Japan and I live in Hawaii where there is not a big Indian food scene). I made this yesterday. It was good, however, it didn’t taste as sweet or tangy as the one I had in Okinawa and now it’s driving me nuts to want to perfect it. Any advice on how to make it a bit sweeter and tangier? Mahalo! Hi!! I would add a little sweetness, maybe some brown sugar or honey? I think that would do the trick. For the tangy, what about some citrus? So I have just completed the amazing butter chicken recipe, get cooking the rice and I just noticed you sprinkled an additional herb on top! What is it? Also, I’m going to have to save the naan for attempt two, forgot to get yeast at the store. But the recipe is amazing, easy, and makes my apt smell divine. Thank you! Cilantro. Hope you love this!! Made this a few days ago with all the required ingredients. It was an easy recipe to make and tasted good, but it definitely doesn’t like butter chicken. Love all the recipes posted here and will keep trying more! I made this recipe last night and loved it! It was a lot of first for me – first time making Indian food at home, first time using my crock pot, and first time using the red curry powder I bought ages ago. Anyway, this recipe was absolutely delicious! I’ll definitely be making it again. I can’t believe how easy it is, either – just mix everything, chuck in the crock pot, and forget about it (though I did stir it every hour or so, mostly to check on its progress). I got nervous because the sauce seemed thin for the first 3 hours but then it thickened beautifully. Thanks for this! Hi! I made this tonight, haven’t tasted yet but the smell is heavenly! My question is in my crock pot by the end of it cooking there was like a layer of some oil that kept wanting to seperate, and seemed soupy. The picture it looks thicker, also I had 3 lbs of chicken so I attempted at adding more ingredients to make up for the extra chicken. Is the oil normal or did I put too much of something? Hey Aimee, I would just leave the top off of the crockpot. That will thicken the sauce. I did not have any oil on mine, so maybe you added a bit much or was you chicken fatty? Hope you love this! Btw, do you use 0% or 2% yogurt for the naan? I made this today and it was delicious. I actually made it on the stove as my daughter forgot to take it out of the fridge and put it in the slow cooker this morning so I had to cook it fast after work. It still tasted great and I look forward to making it again in the slow cooker. All I have is a can of Cream of Coconut… Can I use this instead of the coconut milk? I have every ingredient on my shelf to make this recipe. I opted to use what was in my freezer, boneless/skinless chicken thighs. I did not add the cayenne because I was making this for the very first time tonight and did not want the additional heat. In the last hour, I added a handful of raisins. I had to stop what I was doing to write a small review, my thoughts. Here I am and I must tell you that I love the ease and taste. Definitely, 100%, I will make this again and share the recipe for those who are not afraid to cook in the crockpot. I’m so excited to give this a try! I’d like to double the chicken so I can share with guests. Do you recommend doubling all the ingredients as well? I tried doubling this when I had a party with some friends… it was WAY too spicy! Also inedible! And i love spicy food…Next time I’d definitely adjust accordingly.. maybe put less cayenne powder or less paste. Thanks for the tip Lisa. I’ll probably just make the normal base and add a little extra liquid and curry. No Offence but once you use Thai Pepper, curry powder in the Butter Chicken, that no longer is butter chicken and then you add coconut milk that is BIG NO in a North Indian cooking. This can be fusion chicken curry not please don’t label it as butter Chicken. One of the Most important ingredient of butter chicken is Fenu Greek Leaves which is completely missing. So this can be very tasty but it is not butter chicken. I didn’t Mean any offence. People can easily buy these leaves in Indian grocery store. I made this yesterday and it was DELICIOUS and so easy! I also made the homemade naan that you have on the website and it was amazing. Apparently I wasn’t paying close enough attention at the grocery store and ended up with full-fat Greek yogurt, but I’m assuming this will be every bit as good with 0% or 2%, too. My house smelled incredible all day! We’re not big on spicy foods so I left out the curry paste and the cayenne, but it still had a nice, light bit of heat. These are the first recipes I’ve made from your site but I’ll definitely be making more. Thank you!! Hi! Found your butter chicken photo on Pinterest and made this a couple weeks ago, getting ready to try another round today. Thank you so much for the crockpot idea – brilliant for curries! Your recipe was delicious. Cheers! Hey! Excited to try this out, but I have a couple questions lol. 1. What is the difference between red and green curry paste, will it matter if I use green instead? 2. Does this freeze well? How long do you cook it in the crockpot/slowcooker? So please help me out! Dunja: You choose: four hours on high or 6-8 hours on low. Most crockpot recipes offer you a high or low option. The only thing I can think of is the curry paste I picked up is concentrated, I am not sure if the recipe calls for not concentrated curry paste. I am not really sure on what could be the issue. I used Thai red curry Paste. Here is the link. Maybe that is the difference? Also, I did not make mine sweet, but you can always add a little honey if you wish. Thank you so much for responding to my inquiry, I will get the Thai red curry paste and try it again. Thank you for this recipe. I work for the San Francisco Fire Dept and made this for my station last night. The recipe with the naan blew everybody away and will be used for years to come. Wow, that is awesome! Thank you! Can I just check of normal plain yoghurt would work rather than using Greek yoghurt? Normal yogurt will work, but it is best if you can drain off any water from the yogurt first. Hope you love the naan! o.o I LOVE Butter Chicken and easy meals to make…I also have a crock pot given to me by a friend that I have yet to use. Thank-you for this recipe, I will definitely try it. what changes should I make to the recipe? If any? So happy you love this recipe, thanks!! I would maybe just sear the lamb before adding it to the crockpot. Hope it turns out awesome!! I tried this yesterday, and you’re right about how easy it is. The sauce is delicious, but my chicken turned out a little tough. I plan to try it again with thigh meat or use the sauce with tofu. Thanks so much for sharing! Hi. Found your website last week and I wanted to try this recipe right away! I made it tonight, minus the curry paste because I didn’t have it. I cooked it on high for 3 hours and the chicken stayed moist. I don’t usually like chicken breasts on the slow cooker because they tend to dry out so I always cut the cooking time a little short. It is delicious and will probably be even better tomorrow. Not sure I’ll add the butter next time (I know it’s called BUTTER chicken but I’m not sure how much more flavor was added with the butter). The sauce liked a little curdled. Is that from the long cooking time of the yogurt with the cream? It’s still good but just a little weird looking. Thanks for the recipe and I’ll definitely try more from your site! I made this for the second time just cause I love it soooo much! I didn’t have cream or Greek yogurt. Instead I used evaporated milk, and regular yogurt (coconut to be exact) and it turned out just as amazing! I forgot to add the butter too, didn’t even notice it was missing. I had a question about the cooking time. I have a newer crockpot and it tends to cook a little hot (I’ve read similar things about the newer vs. Older crockpots). I’ve made a few things recently by following the suggested time and I’ve tended to overcook. Did you use an older or newer crockpot? I’d like to make this tonight but want to make sure I don’t overdo it if I am unable to check it regularly. I used on older crockpot, so maybe go a little less. Hope you love this! altered,as i have a 6qt slow cooker. I think you will need to cook this an hour or two longer. Also, I would not double the liquids in the recipe. I would add more as needed. I am worried it might not thicken otherwise. Hope that helps and let me know if you have any other questions. 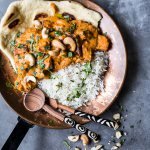 So this is the first time I have ever commented on a blog, but my husband and I LOVE this butter chicken! I first made it several months ago, and every time I ask my husband what he would like me to cook, he requests this butter chicken. Needless to say, I have made it multiple times, and it always comes out amazingly! Thank you for sharing this recipe! That is so awesome! I am so excited this was a hit and thank you so much for commenting! This is my third time making this curry because we just love it! I always make it in a Dutch oven in my oven for 4 hours at 275 degrees and it comes out SO good and it is so easy. I made a big batch of homemade naan to go with it. 🙂 Thanks for sharing!!!! SO happy you love it! THANK YOU!! When u call it butter chicken it should be just that plenty of butter tomatos,cream scented with dried fenugreek leaves,not coconut milk,greek yogurt like making mexican mole with white chocolate chips coconut milk,curry powder has turneric,cayenne pepper,currry paste has ginger,garlic,shallots again there is onion,garlic,ginger. Thats double of everything. No wonder some found it spicy. Like Rahul said u should call it fusion chicken curry or everything but kitchen sink curry. U cannot call a donkey a thoroughbred. Not butter chicken curry. Research showed turmeric inhibits flak formation on brain and good for artharitis. This is an amazing recipe. It looks so amazingly creamy and rich. I know some Indians who toil hard to make that “butter chicken” might have objections to you just throwing in ingredients and calling it a butter chicken, you can just specify that this is a cheat version. I think people will be less likely to get offended. I am however going to try this for certain. I can imagine the taste and the richness. To make it more closer, you could try adding about 2 tbspn of soaked and ground cashew instead of the coconut milk. Authentically cashews are what go in. Thanks Shella!! Love the suggestions! My family lived in Japan for 4 years and believe it or not, our favorite restaurant was Indian. We have been back in the US for 3 years and had given up on tasting our favorite butter chicken ever again. Yesterday, I made your recipe with a few minor tweaks (extra curry powder and curry paste) and it was excellent!!! I too have a newer crock pot and it may have cooked a bit too long so I think I will try the slow cook oven option next time. I used thighs instead of breasts and added extra. This made it a bit greasy, but overall the flavor was amazing! Next time I will try the homemade naan too. Thanks for sharing. I just bought myself an awesome new slow cooker, and plan to break it in this weekend with this recipe! I do have one question for you- what kind of white rice is in the photos accompanying the butter chicken? I’ve been using either wild or brown rice for so long that my mind is going blank on the paler varieties. I love using jasmine rice and that is what is in the photos. Hope you love this!! This was amazing! I did not have curry paste, so I omitted it. I also used 2% milk because it was all I had on hand. The recipe is right to warn about the cayanne… I love spice, but even the 2 teaspoons of cayanne pepper was a little much for me! I also added a touch of honey at the end to add to the sweetness. Still extremely tasty! I will just use less cayanne next time! Thanks for the recipe! I make a LOT of curries– Indian, Thai and Vietnamese as we don’t have a local Indian house nearby. I was intrigued by this recipe being a fusion of sorts…it had not occurred to me to use Indian curry powder and Thai curry paste in one recipe. It’s in my slow cooker right now and tastes good. A few comments on how I made it better. First- Indian curry powder varies hugely and some come with a real kick. Thai curry pastes are always very spicy… and so we have here a very unpredictable amount of heat in this dish for most American palates I think. I recommend you HOLD the cayenne until you’ve tasted the sauce…I’ve already warned my Sweety that his dinner is going to be spicy and I added no cayenne at all… Cayenne is very hot! I also think that the dish lacked some of the nuances of Indian food so I added a teaspoon or so of cumin, coriander and a big pinch of cardamom. This adds to the dish. I did not add butter- with a whole can of coconut AND whipping cream the dish simply doesn’t need more fat. As one reviewer said – this is not butter chicken- with all the tomato it’s rather more like Chicken Tikka Masala – -but it IS yummy and it IS quick and I thank you for the inspiration for busy days! Sadly, we were disappointed in this dish. It was just WAY TOO SPICY. We usually like spicy food, but this was just bordering on inedible. It smelled amazing while cooking and I followed directions exactly. I’m not sure what to leave out if I were to make it again, but probably the cayenne? This is a bummer — I was so happy to find a slow cooker recipe for butter chicken because I love it. I am really sorry this was too spicy for you. My family does love spicy food. Next time just reduce or omit the cayenne all together. I have to say that this butter chicken is a regular in our house. My 2 kids and husband love it. I will agree that curry spices vary. I just bought a new one and it made the dish super spicy. We all loved it but my youngest – to hot for her tastebuds but she added some plain geek yogurt to it to cut the heat…. I quadruple the sauce recipe and freeze the remaining to have on hand for a quick meal or when I don’t feel like cooking. I also don’t always use a slow cooker but just cook on the stove. Thanks for this amazing recipe. I am sooooo going to give this a try! For those folks who live near a Cost Plus/World Market… we sell many international spices. Garam Masala and Curries for sure! I am not sure how the pricing is vs grocery stores but it is another option to look at! btw Tieghan… for a 19yro you sure had me (all of us) fooled! I assumed you were a chef! Congrats on a great site. I book marked you today! If I were to substitute the chicken in this to make it vegetarian with homemade paneer, when in the cooking process do you think I should add it? This recipe looks so fantastic, I’m very excited to try it! About to start making this! Can’t wait. This is in my slow cooker right now! Smells great and can’t wait to make the naan and eat up. I also had to invite my friends for tonight because they were so excited to eat this! We made this but added some vegetables for a one-pot meal. We added 1 smallish white sweet potato, one can diced tomatoes, one green pepper, and a few stalks of celery. It turned out great! can this be doubled if you have a large slow Cooker? Yes, but the cooking time with be 2-3 hours longer and I would not double the amount of liquid, BUT add more throughout cooking as needed. Make sense? let me know if you have other questions. Hope you love this meal! Thanks for the recipe. I really enjoy visiting your blog and was happy to finally taste this one (last week, I forgot to plug in the slowcooker!) I forgot to restock my spices, so I only ended up using curry powder and a generous amount of curry paste, but it was still quite flavourful. The only thing is, it turned out pretty runny, possibly because I used chicken thighs? I ended up adding a butter-flour mixture and that thickened it up enough. What sort of veggies do you all like to serve with this one? I love that it’s so quick to eat after a long day of school/work, but would like to figure out an easy way to make for a more balanced meal. Any recommendations? Thanks for the kind words and so happy you loved this meal!! I feel like the thickness of this meal depends so much on the crockpot, mine is old and does not have a good seal, so I think it lets more moisture out. Good idea with the flour! Also, I LOVE this paired with broccoli or spinach. Thanks again! We just tried this recipe tonight and it was AMAZING. So easy and delicious! Any advice for if we were to add canned chickpeas? Would we need to alter the liquid content or anything? Thanks for always posting such yummy things. I’m obsessed with your blog and am constantly drooling over your lovely pictures. HI! I would keep cooking it on low. Hope you love this! This was my first attempt at making indian food. It was amazing. Even better the 2nd day! Thank you!! Yum!!! My boyfriend would love this!! I’m trying this today and can’t wait to see out it turns out! I am doubling the recipe, so with that in mind do I need to change the cook time? HI Would cook it 2 hours longer and leave the lid off for the last hour to help thicken it. Hope you love this! Thanks! I just wanted to let you know that we made this on the weekend and it was sensation. The chicken was so tender and the flavours were so beautiful, the perfect amount of spice! We also made the fresh naan from your recipe too and it was the closest to Indian restaurant naan I’ve ever tried. This looks amazing. My roommates and I are having a roommate dinner next week and I’d like to make this for us. I usually leave for work around 7:30 and get back at 5:30. Would it be alright to have this in the slow cooker on low that whole time and then switch it to “keep warm” once I get home from work? Yes that will be fine! Hope you both love this! THANKS! Hi there! Don’t know if you’ll have time to respond to this before dinner is served, but I’ve got this simmering in my slow cooker right now and it looks/smells incredible. Tastes pretty great too, but I feel like it’s a bit on the tangy side. I added some sugar…any other ideas on how to mellow the tartness a bit more? Hey Amy! I would add some honey. That will make it sweet and tangy! 🙂 Hope you love this! Hi! I am new to your awesome website! This recipe looks so delish – I am going to make it tomorrow. The few times I’ve tried to cook chicken in a crockpot, the meat gets too soft that I can’t even pull it out of the crockpot without it shredding apart. Any idea what I could do different? Sounds like you need to cook the chicken less. The longer you cook the chicken the easier it will fall apart. I would cook this on low for 5-6 hours. Let me know if you have other questions. Thanks! Hi! I made this yesterday and cooked it on low for about 4 hours. Turns out the low setting on my slow cooker has a much higher temp and cook things faster. It was delicious. We ate it with Basmati rice and I even scooped leftovers with a hamburger bun! Definitely making this again.Thanks for a wonderful recipe. Do you happen to know the calories in a serving for this? I make this all the time (Love it!) but I am curious. I am so sorry, I do not. So happy you love the recipe! Hello! I’ve made this delicious recipe before (and it is so amazing!!) but lately I’ve been experimenting with Paleo dishes… Just wondering how you think the sauce would be if I omitted the greek yogurt and heavy cream? HI Sarah, Honestly, I dont think it would be that great without these. I think the sauce would be thick and not creamy. Let me know if you have questions. Made a vegetarian version of this today. Swapped the chicken for some seitan marinated in the fridge over night and lightly roasted on the pan. Absolutely wonderful. Thanks for the recipe. Bet that was awesome! Thank you! My family and I love Indian food. Butter chicken is just one of the dishes we order every time we eat out at our favorite restaurant. I’m definitely going to try this. I would love to know if you have any secrets for making basmati rice. I stink at it. ? Also, I’d love to find a great recipe for Aloo Matter. Since you have “the gift,” maybe you could create another masterpiece! ? Thanks so much for sharing your gift with us! You’re a peach! Just made this tonight and it was AMAZING. I added some cauliflower at the end just because I had a giant bag of it sitting in the fridge. My husband loved this so much he said he’d even eat it vegetarian style and he is a total carnivore. Awesome flavor! Definitely going into the dinner rotation. Thanks so much for this recipe! Thats so awesome!! I love hearing it! Thank you Lilac! Made this last night and everyone — including two small kids — liked it a lot. Do you think it would work if I added some chick peas too? So happy this was a hit, thank you!! Yes chickpeas would be great in this! I would add dry chickpeas to the crockpot and I think the cooking times should be just about the same then. Or just stir in canned chickpeas during the last 30 minutes or so of cooking. Let me know if you have questions and thanks again!! Once again I have to ask…what size crockpot? Made this last night. My first try using a crockpot. Success! I don’t eat meat, so I baked some tofu and followed rest of recipe. Then I added veggies at the end. Yum!!! When can we pre order your cookbook? SO happy you loved this and swapped in tofu, that is awesome!! 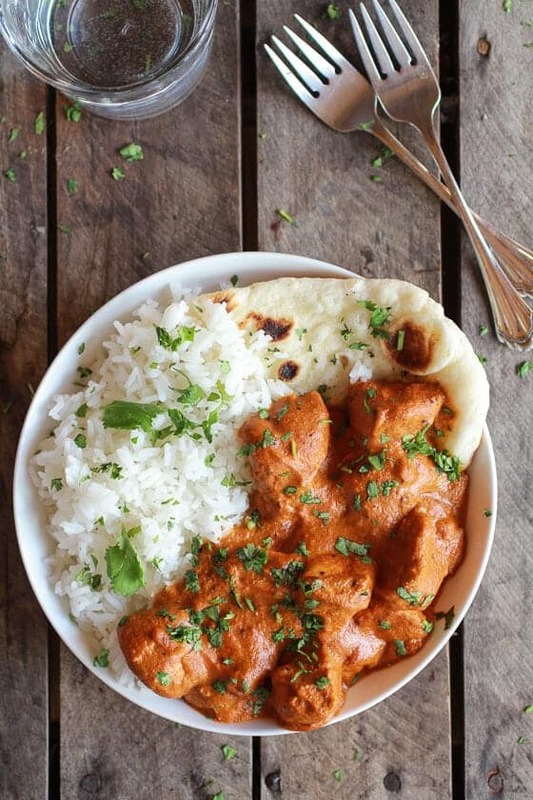 I’ve never left a comment on a recipe in my entire life, but I felt the need on this one….I’ve made butter chicken 4-5 times in the past using very time consuming “authentic” recipes, so I decided to try this because it looked easy and good….and it did not disappoint! I thought it was great! I thought it was interesting because it is an indian dish with a little bit of thai influence. I followed the recipe pretty close using 2 tsp red curry paste, 1 tsp turmeric and 1/2 tsp cayenne. I also added the juice of 1 lime, 1 tbsp fish sauce and 2 tbsp brown sugar. I like it a bit sweeter, maybe could use even more sugar. Mine thickened just fine…..but it does end up a lot of sauce, next time I might also double the chicken. Thanks! By the way, I meant to say, this is BETTER than all the other recipes I’ve tried! HI Bob! I’m so happy you decided to try my recipe!! All that looks great! Doubling the chicken is a good idea for a lot of people! Thanks for commenting, and i’m so happy you liked it!! Hi there! Love this recipe and would like to try it this weekend. Is it at all spicy? I can’t do any heat at all (and we also have a 2 year old) but love the mild butter chicken. HAVE to try this! 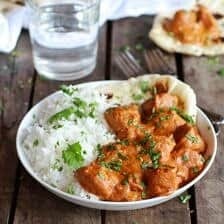 We LOVE Butter chicken and found a way to make it at home with Kitchens of India brand Butter Chicken Sauce packet….I figured it had a gazillion ingredients and we’ll probably always keep some of the Kitchens of India on hand as it’s sooooo fast to cook up. Great to find your recipie and I’m inspired to try my own home cooked version, too! We LOVE Naan, too, gotta try that out, too! thank you so so much for this recipe – I’m in complete awe. I always wanted to cook this dish and was afraid, it would be complicated and difficult, but it really was not! just as you wrote: simple and perfect! The taste was pretty close to my favorite nepalese restaurant, it tasted really delicious. btw. I added 3TS of peanut-butter to the sauce instead of butter and that worked fine. Hi Claire, SO happy it worked out simply for you(: and the taste was good!! The peanut butter sounds great!! So cool that worked! Probably tasted great too!! Th Naan is an all time favorite so I couldn’t be more excited that you made it!! Thanks so much for following, can’t wait to hear more from you!! Can the tomato paste be replaced by sundried tomato paste? It’s not easy to find plane tomato paste here in the UK! Hey Luis! Yes, sun-dried tomato paste will be great! *eating this right now for lunch as i’m writing my comment* I’ve made this recipe about 5 times now and it is absolutely amazing! Even better the second day! Didn’t modify one thing. But I do have to tell you this. The 4th time I made it, I was about 38 weeks pregnant and was trying to do everything in my power to not have to get induced (was induced with my first at 41 weeks – not pleasant). I had read that lots of spices could *potentially* induce labor and I remembered that this recipe had LOTS of spices so I made it for dinner one night and had it the next day for lunch. Went into labor 8 hours later! Coincidence? Sure, but you bet your behind when/if I ever get pregnant again, i’m making and eating this the last few weeks of my pregnancy! Alicia!!! OH MY GOSH! Your comment just made my day. I had to share it with my mom who has been through labor 7 times. Just too funny and so happy you found your “go into labor” meal….lol!!! THANK YOU!! And congrats on the new baby! If one is allergic to coconut milk, do you think regular milk could be substituted instead? Hi Dee! I think that using whole milk will work fine. You can also use half whole milk and half heavy cream. Let me know if you have questions. Thanks! I have read about 3 years of posts here and a few (10 or 20) of your other recipes. (maybe set up so the most current are at the top?) I find you an absolutely inspirational young woman. I’ve copied several recipes from you over several months and find them to be very well made, tasty, and comforting. Please keep up the wonderful effort. Thank you so much Cheri!! I am so happy you are loving my blog! ? Fantastic! I am always a rockstar in the kitchen when I have your recipes on the menu. I made the Naan as well. Perfect balance of salty/spicy. More please! ? Haha that is awesome to hear!! LOVE that you are loving these recipes Beth! I hope you continue to enjoy, thanks!! This looks amazing! I am feeding a crowd this weekend, (12) can I just triple the recipe? Are there things like some of the spices that I shouldn’t triple? I miss never sure how that works! Thanks! Hi Katharine! I think tripling the recipe should be just fine. I would start with 1 or 2 cans of coconut milk, then add more as needed. If there is a spice you know you don’t love, I’d use less of that spice. Also, be sure to use a large crockpot. Let me know if you questions. Thank you!! Made this last night with your naan bread. Both turned out very well. Easy & delicious…who could ask for more?! Thank you. So happy to hear it went well and was good!! Thanks for making it! It is in the crockpot now! I can’t wait will later to eat it. The smell of all of the spices when I was mixing this was amazing!!! Yes! I hope you love this one Renee! Thank you! Yes, Butter Chicken Is my most favorite food! It is really very tasty you know! I am glad to get this useful post. It will make me more easy to prepare. Anyway, you always provide awesome post here! Thank you so much!! Hope the post helps, and you enjoy!! I made this last night and it’s addictingly delicious AND easy! We’re mild Midwesterners so it takes us a while to get used to how Thai food looks—not how it tastes—but I cut the cayenne way down to 1/4 tsp. Makes a boatload of tasty sauce so next time I’ll add more chicken & make more rice, too! I subbed lite sour cream for the yogurt because I always have it on hand. Thanks for the DELICIOUS recipe! I am really glad you loved this Cindy! Thank you so much! Sound delish! If I don’t have a crockpot, could I could on low in a Dutch oven? This was delicious and SO easy! From cooking other chicken recipes in my crockpot, I knew mine wouldn’t take as long as the recipe states – I did mine for two hours on high and then ~90 minutes on low, and it was cooked to perfection! How many calories per serving? What are the macros? What if I wanted to make 7 servings? How would I change the ingredient amount? I am sorry, I do not know the nutritional info. I love this recipe! If I double it for a larger party – do you think 4-5 hours is still ok? Could boneless thighs be substituted instead of breasts? Yes, thighs will be great. Hope you love this! I’m trying this beautiful curry tonight however i think im reading the recipe wrong. What does the 6 and 14 mean after the ingredients above? Does it mean you used 6 ounces of tomato paste and 14 ounces of coconut milk? It did seem very saucy so perhaps i have it wrong. This is our second time making this. It’s absolutely amazing. And it makes my whole house smell wonderful all day. I like to serve ours over basmati rice with a side of store-bought naan that we’ve toasted. Thank you! YAY! SO happy you guys liked it! Those are perfect things to serve with as well, thank you Jen! How many calories is this? Looks yummy! I’m sorry i dint do calorie counts! ): but thank you! Want to make this recipe but wonder how many calories and fat per serving. What makes this healthier than other Butter Chicken recipes. Thanks. Hi1 I don’t count the calories, but if you prefer you can calculate them online. This recipe uses only a 1/4 of the cream, 1/4 of the butter and greek yogurt for protein. Thanks! Thank you for the delicious recipe! SOOO yummy next time I’m going to make 1-1/2 batches rice! We’re not big into spicy so I cut the cayenne to 1/4 tsp but DID use 2 tsp of the red chili paste—SOOOO good! Sounds perfect! i hope you enjoy it again! Thank you! I am SO thrilled you enjoyed this recipe. That makes me so happy. I am not very familiar with tikka masala, so I am not sure…but looking into recipes now. Maybe I can post my version. I can’t wait to try this! How many servings does it make? I’m having a dinner party for 12 and want to make sure I have more than enough. Hey Julia! Its serves 4-6! Let me know if you have questions. Hope you love this recipe! WOW! The food looks delicious and looks great! Made this yesterday. First time using a Crockpot in over 10 years, after practically living out of one for many years prior to that. Flavor was very good but as soon as I went to stir it I remembered that basic truism about using milk products in a crockpot. Add them in the last 20 minutes of cooking so the milk solids don’t render out. That granulated look to the sauce and how watery it is. Instead of the nice creamy, buttery sauce that Butter Chicken is famous for. Not meaning to be rude but if you doubt me, consult the booklet your pot comes with. Still … many awesome recipes! thank you! Hey Daniel, so sorry for the trouble. I have never had this issue before, but thanks for making me aware of it. Glad you loved the recipe! Hey Jessica! Sure! It’s going to taste a little different, but I think it should still be delish! Let me know if you have questions. Hope you love this! This was awesome! Was looking for a butter chicken recipe after eating at a local Indian restaurant . This one is quite tasty, my family loved it. This will go into our monthly rotation. So happy you liked it Carla (: Thanks for making it! I’m trying out this recipe as you speak! I wanted to make something truly scrumptious for my new crockpot. I made this last night but subbed out the chicken for cauliflower and just cooked it on the stove!! It was SO tasty! It got rave reviews from my boyfriend as well! Thanks for the great recipe!!! I made it last night, too, it’s on regular rotation. I always sub cubed tofu. My daughters ate leftovers for breakfast! Thats sounds delicious Sammi!SO happy you liked it, thank you! This looks great. I am thinking of making this dish this weekend. We love to have leftovers. Do I double the ingredients if I want to make 2lbs of chicken? I really enjoy your posts, you are so talented. I am going to make this for a dinner party. May I double the recipe? Thank you! I would double the chicken and do 1 1/2 of the sauce. Please let me know if you have any other questions. I hope you love this recipe. Thank you! We made this dish yesterday. I dumped everything into the slow cooker and I think it turned out fine. I went a little overboard on the cayenne pepper. It was a bit on the hot side. And while I love rice, I think it was unnecessary. Though we didn’t have naan, we had pita, and the pita and chicken was a meal in itself. I am really glad you liked this Nick! Thank you! Hi Stacie! I actually do not calculate the nutritional info for my recipes, but other people have done so through online calculators. Just add all the ingredients in and divid by the serving size. I hope this helps! Let me know if you have any other questions! I hope you love it! Thanks Claire! Excellent recipe! I made some slight changes due to personal preferences. I used 1.5 pounds of chicken and I could have used even 2 without needing to add any additional liquid. For spices, I used a heaping T of garam masala (very strong stuff) and upped the (madras) curry powder to 1 tbsp. Because we’re spice wimps I only used 1 tsp of the red curry paste and 1/4 tsp of cayenne. The dish had just a hint of heat which was perfect for us. Before placing in the slow cooker, I sauteed the onion in a bit of oil, then added the spices and garlic, sauteeing for about a minute to blend and enhance the flavors. I then melted the butter into the mixture, stirred in the chicken just to blend and placed the mixture into the slow cooker along with the milks, yogurt and tomato paste. It was done in 3 hours on high, but my slow cooker is running a bit hot lately. That sounds so great Linda, I am really glad you liked this and it turned out great for you! Thank you! Made this and it was delicious, but very rich. I didn’t have curry powder so I just threw together some spices, like tumeric, cardomom, cumin, cinnamon, cloves, pepper, paprika, ginger, black mustard, think that was it. I added extra spices because I like them and heated them all up in a little oil first to release the flavors. That is so great! I am really glad this turned out amazing for you! Thank you! I made this the other night and it was fantastic. I thought it was going to be too rich when I blended the cream and greek yoghurt together, but then it cooked down it becomes this incredibly flavorful spicy sauce. I warmed up my spices in a cast iron pan with a little oil first, to release the flavors first. Also, didn’t have curry powder but used cardomom, cumin, cloves, tumeric, sweet paprika, pepper, black mustard seeds, onion and garlic powder, in addition to the minced onion, garlic and ginger. I used extra spices because I like it. Didn’t do anything else different. Wondering if it freezes well, with the dairy in it. Will definitely make again! I’ve been making this for over a year and we love it! Funny story: Last year I made a double batch of this and put half in the freezer after I cooked it (minus the rice) because I was expecting baby number 3 and wanted to have a few meals prepared. 5 weeks or so after my baby was born, we unexpectedly ended up having over an Indian college student for breakfast on very short notice. He was telling us the evening before how he doesn’t like American food so I was nervous about serving him a traditional American breakfast. So I went to my freezer and pulled out the frozen Indian butter chicken and made a batch of rice in my rice cooker. He said it tasted great! This is still my #1 freezer meal. My only tip for making this is that I’m often too cheap to buy boneless skinless chicken so I just cut the skin off of chicken thighs and let it cook all day. By dinnertime the chicken is so tender that it is easy to pull off of the bone. I am so glad you and your guest loved this recipe Lindsey! Thank you! Did you use anything different in your recipe? What fat content was your yogurt? Sometimes low-fat dairy will curdle when slow cooked. So sorry for the trouble! Coconut milk — sweetened or unsweetened? Gonna make a huge batch to freeze for later, and I don’t want to mess this up! I’ve made this a few times and it is delicious! I do have a quick question though-the sauce doesn’t really thicken up at all in my crockpot. The only thing I’m doing differently is using low-fat coconut milk, do you think that would be it? Or is the sauce supposed to remain pretty much liquid? Marathi RecipeThis looks so easy and delicious-I want to try it! its very simple to make … really great !! I love this recipe! Do you have the nutritional value per serving? Hi Nalani! I am sorry, but I do not have the nutritional information for this recipes. I find that online food calculators work best. Let me know if you have any questions! Thank you! Hey Tieghan! Any thoughts on how to do this in the InstantPot?? amazing stuff … it looks so delicious. This is one of my favorite recipes. Thank you so much! I’ve made it a few times now and I’m trying to brainstorm what kinds of vegetables I can either cook alongside or toss in near the end. I’ve made a turmeric roasted cauliflower side so far. But the idea of just tossing something into the pot near the end of cooking sounds much more efficient. Any suggestions? Oh my goodness…so, I made this recipe years ago, and absolutely loved it! Not only did I love it, but my family (including some picky eaters!) all devoured it!! I had the recipe in a notebook that I later needed last min for a class. I pulled out the recipe page, and gave it to my Mom for safe keeping. Luckily my Mom kept it safe for over a year, and when I recently remembered this dish, I was so excited she still had it. I gave my husband the recipe to run to the store for ingredients….and.he.lost.it!!! I literally almost cried and have been searching the internet for over a week. I didn’t think I would find the right recipe because their are SO many…but right when I found this page I recognized it! So happy to have found it again! (& so is my hubby! Considering he has been in fog house for a week lol). Thanks for the great recipe and family favorite! Ah that is so amazing! Thank you so much Amanda! I am so glad you and your family love this recipe! 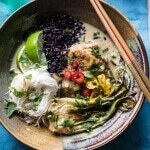 I’ve been reading the blog for ages, but have only just found this recipe – it looks delicious! The only thing is, i don’t have a crockpot – could you suggest how i could adapt the recipe for a cast iron dish, either in the oven or on the stove? I absolutely love this recipe. Its so easy and its delicious. I’ve never had naan before. Its a must with this dish. Yummy! I made this last week for friends and they all LOVED it! I was hoping to make it again next week but I have a few friends that are vegetarian. Do you think you could swap the chicken for potatoes? Or something else? I would love to serve this vegetarian style but since I am not vegetarian im not really sure what would work best or how to go about that? thanks! I work about an hour from home – any way this can stay on low for 9-10 hours? Or conversely how is this reheated if I make it on Sunday for Monday’s dinner? If I were to do this in the Instant Pot, how long would I cook this for? I LOVE this recipe but switched out the slow cooker for the Instant Pot. This was so good! I also tossed in about half a cup of steamed lentils near the end because I had some leftovers in the fridge. All this and some mango chutney…probably the best homemade curry I’ve made so far. Loved it. Thank you!! I am so glad you loved this Eliza! Thank you! This worked out to be a great recipe. But had you meant to post 10 of essentially the same picture?? Absolutely adore this recipe. Wondering what the odds are you have tried it in the instant pot and have a time conversion?! I had horrible heartburn while pregnant and couldn’t eat food that was spicy or heavily seasoned…this was on my list of foods to make once the baby was born, and today is the day! We love this recipe!! I’ve made this many times and am wondering if this can be made in the instant pot? If so, can you provide instructions? Thanks!